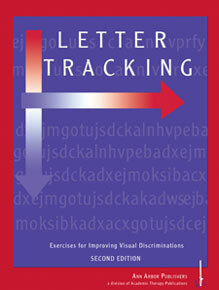 Ann Arbor Letter Tracking is designed to improve visual discrimination in students. Problems that may be caused by the lack of good visual discrimination include reversals, skips, left to right directionality, omissions, substitutions, and excursions over the page with the eyes. Letter tracking programs are appropriate for beginning readers, remedial cases at all levels, and adults. The second edition features expanded instructions, a revised progress chart, and clearer page layout, but the exercises are largely the same as the earlier Letter Tracking Book 1. Lessons in Letter Tracking progress from 24 to 19 point font size. If the type size in one section is too large or too small for a particular student, switch to a section with more appropriately sized type. The number of different exercises makes it unlikely that a student could change exercise results by memorizing tracking sequences. Users are permitted to copy exercises in Letter Tracking for classroom or clinical use, as long as the content is not sold.